Music by David Shire and lyrics by Richard Maltby, Jr., debuting on Broadway in 1996 and based on the 1988 film "Big" starring Tom Hanks. The anti-Peter Pan, thirteen-year-old Josh Baskin, humiliated after being turned away from a carnival ride for being too short (in front of the girl he has a crush on, who gets on the ride with her tall sixteen-year-old boyfriend), desperately wishes to be big. 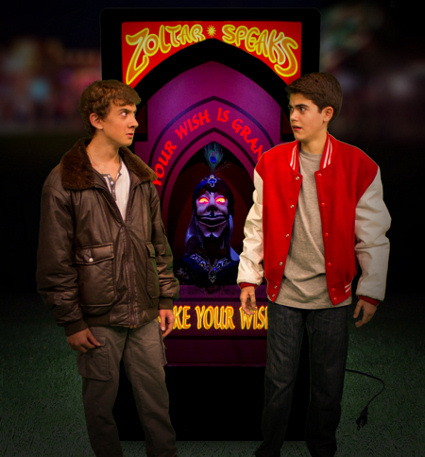 Thanks to an unplugged Zoltar Speaks arcade game, Josh wakes up tall � and about thirty years old. But there are valuable experiences from going through childhood that both Josh and some of his new adult co-workers begin to realize. 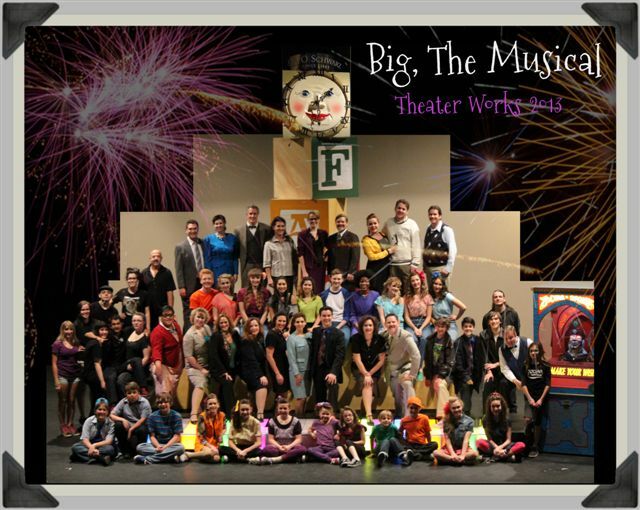 A strong score and story makes this musical stage version of the hit film Big a great choice for people regardless of height. This Theater Works production has adult actors in all the adult roles, and it features tons of talent from both the bigger and shorter actors. Aaron Zweiback stars as Young Josh. The right age, the right look, and a fantastic young performer who nails the anxiety of youth including his amusingly awkward attempt to talk to Cynthia Benson. He is the mini-me to Adult Josh, Dennis J. Clark, who bears quite a bit of resemblance to a young Tom Hanks and who gives an extraordinary performance as the childlike adult finding himself dealing with grownups who have become a bit cynical and long forgotten what it was like to be young. The two of them team up superbly in I Want to Know as they find love with his new coworker Susan. Marissa Vatsky gives a beautiful performance as Susan, her character growing slowly and genuinely as her growing relationship with Josh reminds her of things she�d forgotten, reminiscing in Dancing All the Time, not to mention some hilarious reactions to the unexpected youthfulness of Adult Josh. The charismatic Alex Tuchi is terrific as Josh�s friend Billy who pushes him into having the courage to approach Cynthia, then pushes him to return to their childhood. Other strong performances come from Mathew Zimmerer as toy company owner MacMillan (yes, they have a big floor piano and dance out Chopsticks), Maria Amorocho as Josh�s mom who sings a powerful Stop, Time as she sees her son�s friends growing up while her son continues to be missing, Lee Pitts as the Type A, ultra-competitive Paul, and Kat Balles is a total riot as Josh�s quirky secretary Mrs. Watson who is a little befuddled by her eccentric new boss. Director Robyn Allen and her top-notch creative team, including youth director Chris Hamby and choreographer Paul Pedersen, have this show perfectly paced, transitioning flawlessly between fun to serious, and always looking great. Both their youth ensemble of freewheeling kids and adult ensemble of grownups adhering to their societal norms capture their moments, and mesh together nicely as Josh teaches the adults to channel their inner child at the company Christmas party by kicking off a big Cross the Line dance.